The Toronto Dingos faced the Toronto Eagles in their recent AFL Ontario round eleven fixture. When these teams faced off in their postponed round one match recently the Eagles came out the victors 11.21-87 to 2.6-18. The Dingos came in looking to make amends having put in a better showing against the Hamilton Wildcats in between the two fixtures. The first quarter was a tight affair with both sides getting plenty of ball at the contest but neither able to apply significant pressure in their respective offensive 50s. The Eagles managed to nab two goals for their trouble but the Dingos also pulled things in with one of their own. The first quarter finished with the Eagles up 2.2-14 to 1.1-7. In the second quarter Sean O’Reilly joined the on-ballers and had an immediate impact launching a long range bomb from inside the centre square off the ruck contest that bounced straight down the middle of the goal square for a goal. Steven Speers, Patrick Bossey, and Michael Ladd were again relentless in contests around the ground leading to the Dingos getting more of the ball throughout the second. Meanwhile Dingos forwards Rob McNaughton, Thomas Santibanez-Espinosa, and Ben Moller were able to take advantage with an efficient performance up front throughout the quarter. Despite being outscored in the second quarter at halftime the Eagles still held onto a slender lead 5.4-34 to 5.2.32, leaving both sides with plenty to talk about during the long break. After both sides made some adjustments it was the Eagles who would come out in the third and take the game by the scruff of the neck. They were able to quickly apply pressure to the Dingos backline adding a quick set of goals to their tally. Dingos coach Mike Karas responded by moving Stephen Gordon playing his 50th game for the club - into a tagging role on the halfback-line and while his efforts assisted in slowing the flow the Eagles ultimately added three goals and seven behinds for the quarter. The Dingos were not completely without opportunities at the other end but were not able to convert them with the same efficiency as in the second quarter. Thus it was that after another promising first half the Dingos found themselves going into the final quarter down 8.11-59 to 5.6-36 and with a lot of work to do if they wanted to get back into the match. 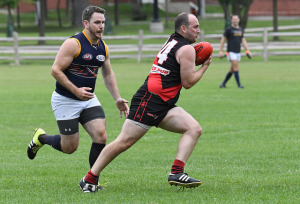 The Eagles though, a team with premiership aspirations this year currently sitting second on the AFL Ontario ladder, were having none of that quickly stamping out any such hopes adding three goals in the final term to close this one out 11.15-81 to 5.6-36. Rob McNaughton was awarded the pewter for best on ground. While the Dingos were able to show glimpses of what they are capable of in the first half of this one they will need to work on their ability to bring that same level of play for a full four quarters as they start to turn their attention to building for next season. For now though there is still the opportunity to finish the season on a high this Saturday (August 25th) with an upcoming match against the visiting Ottawa Swans in what will be club founding member Paul Tinker’s 200th game as a Dingo. Afterwards they will head to the AFL Ontario league awards night where Canadian rookie Lynden Evers, in the best again against the Eagles, is nominated for rookie of the year and several others are nominated for the All-Ontario and Canadian All-Ontario sides. Meanwhile rumor has it the Irish lads will be safely tucked up in bed by sundown after a few raspberry cordials with high hopes of making it to yoga early on Sunday morning.